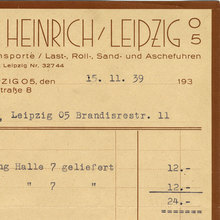 A set of tall narrow caps, accompanied by a few lowercase characters with enlongated ascenders (‘bdfhklſßt’) and small numerals, to be combined with the lowercase of Edel-Grotesk or Wotan-Grotesk (i.e. Norddeutsche’s and J. Wagner’s versions of the typeface also known as Aurora-Grotesk ). First cast in 1927 by Norddeutsche Schriftgießerei and later by Johannes Wagner.